With the increase in the planned density at Daybreak concerns have surfaced about the increase in traffic. The current plans for Daybreak call for over 20,000 homes to be located within the community. All of these residents will have cars. Most of them will have more than one along with more than one member of the family to drive them. If you do the math on these numbers you can easily see the thousands of car trips that will be necessary for each family daily. However, these calculations are based off of the traditional suburban model of traffic. Daybreak follows the principles of New Urbanism and studies have shown that there is a significant difference in the amount of traffic generated by these diametrically opposed planning schemes. New Urbanism improves transportation choice and reduces traffic speeds. These New Urban design features tend to reduce per capita automobile ownership and use. While most individual features have modest impacts on total travel, their effects are synergistic resulting in significant total reductions in vehicle use. Research has proved that residents that live in well-designed New Urbanist neighborhoods with good walkability, mixed land use, connected streets, and local services tend to drive 20-35% less than residents in automobile dependent areas. Another study has concluded that these residents take 305.5% more walking trips than residents of conventionally designed suburbs. While these benefits have not materialized immediately in Daybreak, most of the research suggests that these benefits will not be realized until developments are "made whole" with the majority of basic needs within a short distance of homes. 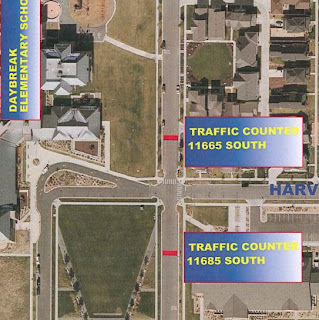 Â In addition to the traffic reducing affects of mixed-use communities, Daybreak offers a variety of traffic calming structural features in its design. The most noticable of these are the two roundabouts that deflect traffic from two fairly high-speed parkways that lead to Daybreak from Bangerter Highway. 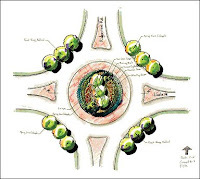 These arterial roundabouts distribute traffic in a more efficient manner than 4-way intersections and slow traffic down upon their entrance to Daybreak. Recent studies have also proven that roundabouts significantly reduce vehicle crashes compared to intersections. Another traffic calming feature is the neckdowns that are placed at most intersections in Daybreak. Neckdowns are curb extensions at intersections that reduce the roadway width and tighten the curb radii at the corner. Again this feature slows traffic, but it also decreases the distance that a pedestrian must travel to cross the street and makes the pedestrian more visible. There are other traffic calming measures, but these two are the most effective. Â Even with all of these measures, there are still drivers that choose to speed down the street, racing to their destination. This practice has irked quite a few residents in the community including the Daybreak Daily website author Scoop. He decided to do somethign about it and worked with the City of South Jordan to monitor the traffic on a particularly problematic street in Daybreak where drivers tend to speed. The street in question is Kestrel Rise. One of the main problems with this street is that when driving South you drive down hill. This obviously increases speed and many do not slow down until they are only feet away from a stop sign. While these studies gave an average speed of 25 mph, this is simply an average. The traffic monitoring devices registered speeds of up to 50 mph on this street. Of course speeds like this did not happen every day, but speeds of 35 to 40 mph are fairly common depending on the day of the week. What additional options are there to preven cars from accelerating to 50 mph in an area where kids play? A few design features come to mind. Traffic slowing features such as humps or speed bumps as some people call them. These features actually come in a large variety and are one of the most effective design features in slowing traffic speed. There is a downside to this though. Cost. You would think that making a bump in the road would not be very expensive, but in this case a properly designed bump can cost thousands of dollars. The question that keeps popping up in my mind is this: Isn't a few thousand dollars worth it when a simple design feature can (and probably will someday) save the life of a child? Especially considering this street is adjacent to an elementary school. I would deem most streets in Daybreak to be safe. This safety is due to the design features that were likely planned from the very beginning. However, no plan is perfect and some adjustments need to be made here and there. While speed humps may not be the answer, planners and the community need to do something about people driving 35 to 50 miles per hour past homes full of children and an elementary school. I guess the real truth about a stop sign lies in the statement that it "would significantly force cars to slow down". Some cars in Daybreak slow down for stop signs, a few stop but most just run them. About 2 in 10 actually stop. Good suggestion, tho', just doubtful in it's effectiveness. Stop sign at Kestral Rise Rd. A stop sign at Kestral Rise where it meets Silent Rain Dr. would also significantly force cars to slow down and is a major crossing point for kids going to school.